Remember is an exploration of personal community. In this case the community is comprised of the mobile devices we carry with us everyday. The layers of technology that we tote around with us daily create a digital second skin. The jacket is a physical representation of this second skin and is wired to display the communication between our digital devices. In this project we empower the objects to converse with each other through the use of Bluetooth. The conversation serves two purposes. The first goal is for the objects to stay in touch with each other. If one of the objects goes missing, leaves the conversation, the jacket will visually displays the disruption. The second goal is for the conversation to create a shield of digital noise that will prevent any attempt to access personal data. Finally, the devices and the Jacket are equipped with physical switches. 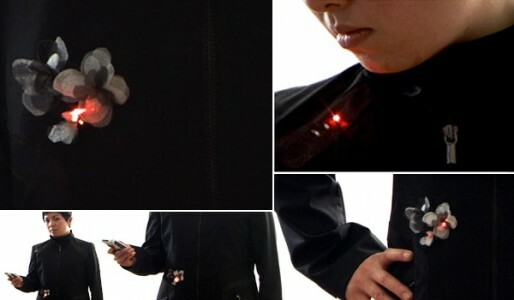 The LEDs on the jacket displays whether all the devices are connected or not. This function creates a physical security of the items. Developed in Every Bit You Make at Interactive Telecommunications Program at New York University.